These are the same ones used by FlyCafe and many other major Fly Culturing companies. 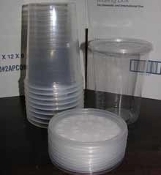 1 Cup with vented lid for use during feedings. This item was added based on customers' requests.